The short story is often regarded as an under-appreciated art form. The mainstream publishers have habitually baulked at supporting them in the face of sales figures that compare unfavourably with those of traditional length novels. This has often led authors, particularly crime and mystery ones, to only pen short stories on commission rather than write them out of pure creative enjoyment. But that hasn’t stopped many of them rising to the challenge of expressing themselves through brevity. Creating a snappy, compelling tale with fascinating characters and quickly weaving it all into a striking conclusion that stays with the reader is no mean feat, and deserves high praise. But some excellent short stories have received more recognition than others, so this feature is to champion my favourite short pieces of fiction that have been underrated – or even criminally neglected – over the years. Many of Conan Doyle’s 56 Sherlock Holmes short stories have of course received glowing acclaim and been adapted in some way for the screen. The likes of ‘The Speckled Band’, ‘A Scandal in Bohemia’ and ‘The Final Problem’ top many people’s favourite lists, but for me ‘The Five Orange Pips’ has always been left, undeservedly so, in the shade. The showcasing of Holmes’ deductive skills that follow is particularly divine, and the ending is wonderfully elegant. Interestingly, this is one of only two Holmes short stories where the detective’s client dies. 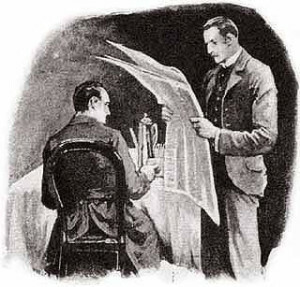 The 1945 film Sherlock Holmes and the House of Fear was partly based on ‘The Five Orange Pips’ while a 2014 episode of the TV show Elementary took some facets of the story. A story of a deranged man whose disappointment in love sparks an irrational reaction that leads to a cruel deception, this is Highsmith at her neurotic best. Obsessed with dark subject matter throughout her writing career, this story was heavily inspired by a painful moment in Highsmith’s own love life. After engaging in a blissful affair with English doctor Kathryn Cohen during a holiday in Italy in the summer of 1949, Highsmith returned to New York and wrote to her. Each day she awaited a reply from Kathryn that didn’t come, suffering inner torment. In ‘The Birds Poised to Fly’, Don returns from a holiday romance smitten with Rosalind and writes to her proposing marriage. When she doesn’t respond he convinces himself that her letter was delivered to his neighbour by mistake. He breaks into his neighbour’s mailbox, finds a letter written to him by a lovesick woman called Edith. Don assumes his neighbour’s identity and replies to Edith, arranging to meet her at Grand Central station. Eventually Rosalind replies, refusing Don’s marriage offer. A dejected Don still goes to Grand Central to meet Edith. “The story is so much K and myself” Highsmith later wrote in her diary. It wasn’t published until 1968, in Ellery Queen Mystery Magazine, before being released as part of Highsmith’s short story collection, Eleven. James Bond is captured in a rare morose mood during this dark, counter-espionage tale that was first published in The Sunday Times supplement of 4 February 1962. Assigned to prevent a prolific KGB sniper – codenamed ‘Trigger’ – from killing a fellow British agent who’s due to make a street crossing between East and West Berlin, Bond waits patiently at his hiding post for three days and nights, contemplating his mission to take out the KGB assassin. A killer killing a killer. Fleming delves into a corner of Bond’s psyche we’d never quite seen before as he broods over the concept of committing a cold, calculated murder (with no high-octane build-up), something he’s clearly uncomfortable with. Each night he sees an orchestra arriving and leaving a building opposite for practice, a beautiful blonde cellist among them. When the agent is finally ready to cross over to Bond’s side of the street, Bond peers through his rifle scope to see the Russian sniper take up position in the building opposite. ‘Trigger’ is the blonde cellist. Faced with an instant decision and his finger on the trigger, Bond switches aim, shoots the stock of her sub-machine-gun, wounding her hand. The relieved agent makes it back into MI6 hands safe and sound, but Bond gets an earful from top brass for failing to execute the kill. Bond is always at his most compelling through the theme of disobedience, and Fleming exploits that beautifully in this short work. Intrigue lays at the heart of this tale, which formed part of Lehane’s collection of short stories titled Coronado, released in 2006. Tension is present from the off when the protagonist, Daniel, is told by a woman regular in his local bar that a couple of guys were in earlier asking after him. Wearing smart suits and ties. A worried Daniel visits his ex-wife, who describes the same guys stopping by earlier looking for him. The mysterious well-dressed men (possibly federal agents, although it’s never revealed) are soon pursuing Daniel in a car chase. He takes refuge in the grounds of a large hospital, shifting from one specialist area to another before settling in the vast ICU unit. Daniel, seemingly ignorant of his offence, remains in hiding there, becoming acquainted with family members of critically ill patients in the waiting room, and pretending to be a relative of one himself. His world is now one of helplessness, quiet anticipation and confinement. Lehane’s exquisite turn of phrase and tight prose comes to the fore here, unravelling the character at his own pace and always keeping the reader guessing – not to mention engrossed. The story, more than a passing nod to Franz Kafka’s ‘The Trial’, depicts one man’s journey to grasping the concepts of empathy and humanity, but without making any moral judgements. A fascinating read. This 1927 story is an immaculate piece of writing but, perhaps due to its style (minimalist to the core, there is hardly any plot), never attracted as much praise as some of Hemingway’s more famous short pieces such as ‘The Snows of Kilimanjaro’, ‘A Clean, Well-Lighted Place’ and ‘The Short Happy Life of Francis Macomber’. Two hit men walk into an Illinois diner looking for Swedish boxer Ole Anderson, who they plan to kill ‘for a friend’. The duo tie up the proprietor, George, the cook, Sam, and the lunchroom’s only customer, Nick Adams (a recurring character in Hemingway’s short fiction), and wait for Anderson, who they’re expecting to walk in. But he doesn’t show up and the frustrated duo leave. George knows the boarding house Anderson is staying at and sends Nick over there to warn him. When told about what happened, Anderson is resigned to his fate and tells Nick there is nothing to be done. Having spent his younger years in Chicago during Al Capone’s rise to power, Hemingway had a strong knowledge of prohibition-era organised crime and weaves this understated story with an authoritative voice and from a marvellously objective viewpoint. Part of the 2006 Damn Near Dead anthology, a collection of invigorating short stories based around senior-aged criminals, this story is dripping with smart, black humour. Set on a golf course in the grounds of an Oklahoma retirement community (“the land of broken hips and strokes and backs thrown way, way out”), three old timers, narrator Roscoe Carter and friends Tony DeLuca and Pete Dexter, are having a round. A wayward tee shot from Tony strikes a course groundskeeper in the skull, killing him as he’d been raking a bunker. Tony, hinting that he has a bad history with cops, convinces Roscoe and Pete to help bury the guy in the sand. Roscoe, a retired army veteran who’s just been told he has four months to live with stomach cancer, wants to spend his remaining time playing golf, not seeing the course closed down as a crime scene. News of a major fire sweeping through the state towards them causes many of the panicked residents to flee, but Roscoe has no relatives who’ll take him in and is in no mood to go anywhere. “All I had was a set of Ping irons and a tee time.” He gets in his cart, takes to the course, flames swirling in, smoke burning his eyes, the course record for the over-65s the only thing on his mind. Gischler’s riveting prose makes this a darkly perverse, hilarious yarn. The first entry in Welsh’s 1994 short story collection, The Acid House, this taut, stark thriller set in Hackney is a classic example of what makes a gripping short story. An underlying sense of unease is present throughout as the narrator Jock sits through an uncomfortable meal with his bad-tempered mate Gary, his wife Marge and their young daughter. Later, Gary, recently out of prison for theft, and Jock talk through a plan to scare Tony Whitworth, who owes them two grand. They agree to pay Whitworth a visit that night. Jock turns up with a baseball bat, Gary brings a sawn-off shotgun. Gradually that sense of unease turns into outright menace as Welsh skilfully cranks up the tension, the anxiety and curiosity peaking within the reader, until laying out a shocking and valiant ending where everything is at stake.